Tired of your dishes looking spotty and dirty, even after you run them through your dishwasher? Your detergent isn’t to blame; the drying process is the culprit. If your dishes don’t dry rapidly, but instead sit with water droplets on them, you’ll have spotty, streaky glassware, cutlery and plates. Washing again won’t help — you need to use a rinsing aid to get the clean, clear look you want. Learning more about rinse agents and what they do can help you decide if this product is for you and help you choose the right brand for your needs. What is a Rinse Aid? Even though the word “rinse” makes up its name, a rinsing aid doesn’t actually rinse your dishes at all. This specialty product is used after detergent to help remove excess water and moisture from your dishes after they are clean. A residential dishwasher uses steam and a rinse aid to ensure that dishes are free of detergent residues and clean enough to be put away once the cycle is complete. A rinsing aid can also ensure that your glassware, stainless steel and other washables are free of water spots or smudges. If you have ever been through a commercial car wash or washed your own vehicle and used a rain repellent on your windshield, then you’ve seen a similar product at work. Dishwashing Science: How Do Rinse Aids Work? Rinse aids and agents vary in their specific formulas; each manufacturer has their own proprietary blend of ingredients that make up their product. While each brand is unique, they all work the same way. A rinsing agent is made up of a chemical or organic surfactant that naturally prevents water from remaining on the surface of your glassware and dishes. Water has a natural surface tension; this tension is what makes raindrops or dripped water bead up when droplets fall on a non-porous surface. Those droplets take far longer to dry – and when they do, they leave behind a ring (or streaks, if you wipe them off). A surfactant affects the way the water behaves on the protected surface, and prevents water from beading up or forming drops. When there is no surface to cling to or way to bead up, the water naturally falls into sheets and drains from your dishes and glassware. 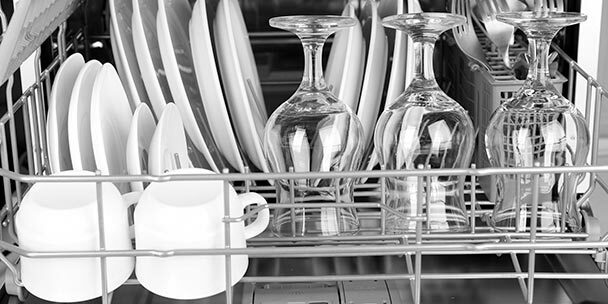 In the dishwasher, a rinsing aid disperses throughout the compartment and ensures that droplets of water can’t form on your dishes. This allows for speedy drying, less food borne illness risk and cleaner, better looking dishes. Alkalies to assist with removing food from the surface of your dishes and regulate the pH. 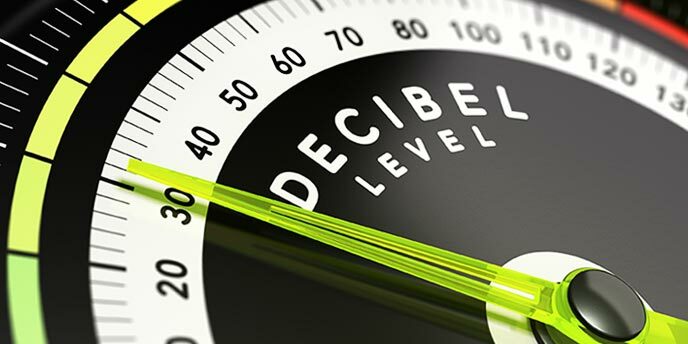 Builders to soften water and prevent lime scale deposits. Bleaching agents to oxidize stains and ensure they are removed. Protease to break down egg, meat and other protein-based stains. Amylase to break down pasta, oatmeal, potato and other starch-based stains. Once the detergent has done its job, a rinse aid assists with drying and ensures dishes are shiny and free of streaks or spots. 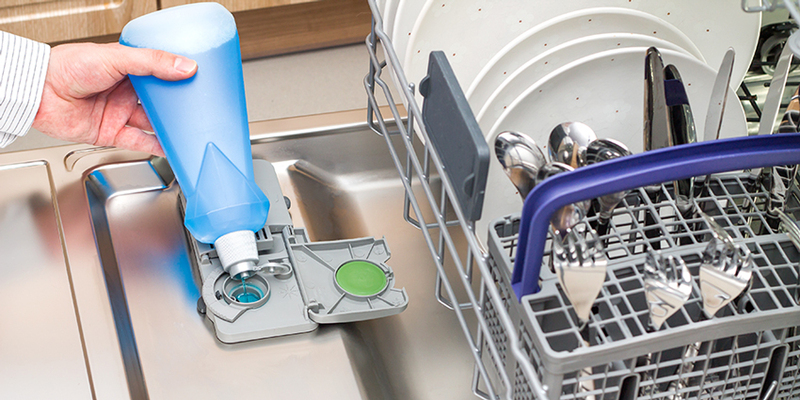 A rinse aid typically contains a non-ionic surfactant which turns water drops into a thin sheet that runs off of dishes with ease. Some brands also contain a polymer that helps create a shiny finish. According to the U.S. Department of Agriculture, Food and Nutrition Service, & Institute of Child Nutrition (PDF), plates used in a commercial setting need to be cleaned, sanitized and air dried before they can be reused. Commercial establishments use a dishwasher or a three basin system with heated water to remove food debris, rinse dishes and sanitize glassware, cutlery and serving ware for reuse. Careful care in both the commercial and home setting ensures that plates and utensils are safe to eat from and do not harbor any bacteria or food particles. Placing plates and other items in a cabinet or storage bin while wet could impact food safety; taking the time to fully dry dishes ensures that all kitchen and serving pieces are safe to eat from. In 2010, the Environmental Protection Agency changed the way detergent companies could use phosphates in products for home use. While these cleaning agents worked well in home dishwashers, they could lead to algae development inside the machine itself. Removing phosphates made home dishwashing detergents less effective at cleaning and more likely to leave buildup and water stains behind. 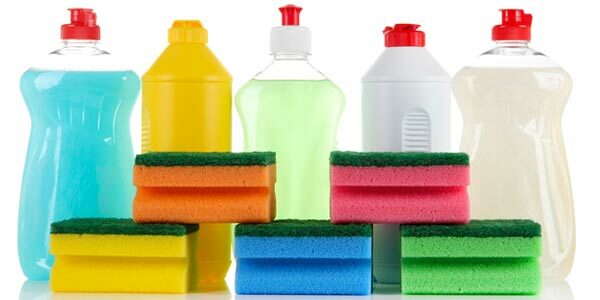 Rinse aids are more useful than ever in the home environment, as the effectiveness of cleaning agents has been impacted by the removal of phosphates, the cleaning process could leave behind limestone, chalk and other trace minerals. These deposits and simple water stains leave dishes looking dirty and like they need to be washed again, even if they are acutely clean and safe to use. 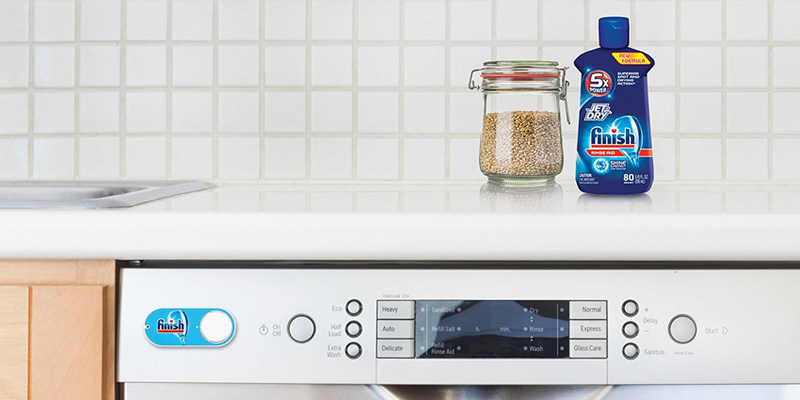 A rinse aid speeds drying and eliminates trace deposits and water stains, leaving behind more attractive and aesthetically pleasing dishes. 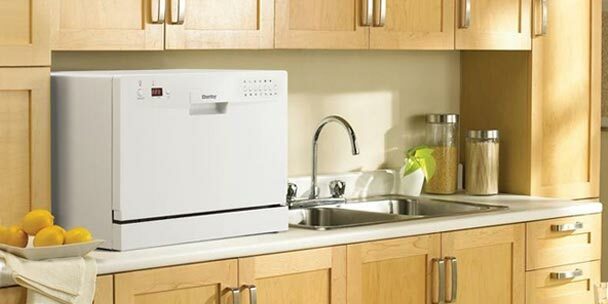 Most commercial establishments use high powered dishwashers with sanitization and built in drying capacity. Clean dishes are obviously essential in a restaurant setting; customers won’t have a good perception of your business if the glassware you use is spotty and unsanitary. Food safety outbreaks are also far more dangerous in a commercial establishment, simply because more people are exposed to risk. Most restaurants are equipped with the “right” dishwasher and supplies to sanitize dishes, but for commercial establishments that do not regularly serve food or that rely on a residential dishwasher, a rinsing aid can improve customer safety and their perception of your business. What Happens If You Don’t Use a Rinse Aid? 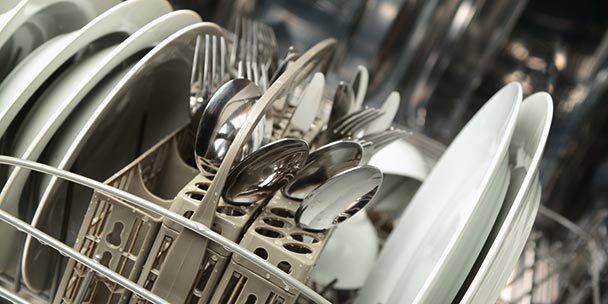 If you do not use a rinse aid, your dishes, glassware and cutlery may not look as clean as you like, and running them through the dishwasher a second time won’t help. The water marks and mineral deposits are there because of the way your dishes dried, not because they are not clean. 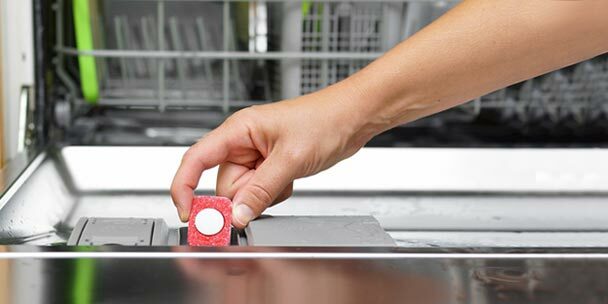 A rinse aid can help you get better results from your dishwasher and help protect your investment as well. Water won’t be able to build up inside, so you’ll need to clean the actual machine itself less often. There are several commercial brands to choose from, depending on your needs and preferences. Some brands use a chemical surfactant, while others use a proprietary blend of more natural ingredients to get the job done. According to Treehugger magazine, you can even use white vinegar in the rinse aid cup of your dishwasher if you are concerned about chemical use. Does Waterford Crystal leach out lead or is the crystal milky due to other reasons? using white vinegar in the dispenser is a no-no, according to many across the web – it’s too strong an acid and can do in the rubber fittings in the dispenser.